Make a Slingo on the 5x5 grid and win big with Big Money Slingo Bonus! The colourful game will get you winning instantly as well! 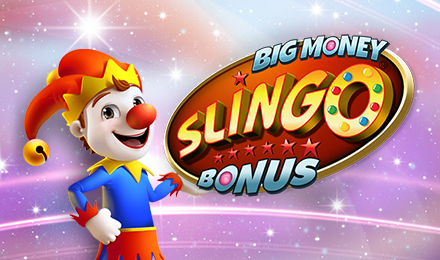 Big Money Slingo Bonus is the sequel to its big brother, Big Money Slingo. The bonus version consists of bonuses and instant wins! Also, a jackpot that can be triggered easily. The classic mix of slots and bingo is a 5x5 grid where cash pointers display prizes for a line win. Make a Slingo horizontally, vertically or diagonally on the grid. Trigger a jackpot of £250,000 and free spins. Trigger the bonus wheel by collecting all five of the keys and stand a chance to have a guaranteed win of £250!